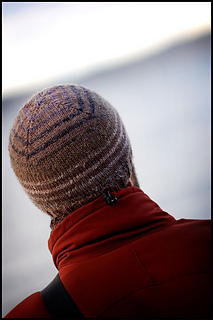 A simple striped beanie pattern that plays with self-striping yarns and is perfect for using up worsted weight yarn scraps and practicing the jogless stripe technique. I recommend using a solid or heathered yarn for the MC and a self-striping yarn for the CC (Noro or handspun both work lovely). 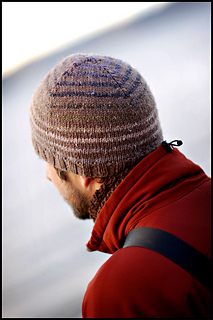 This hat utilizes raglan-style decreases at the crown which turn the stripes or ‘rings’ into diminishing square shapes on top of the head. 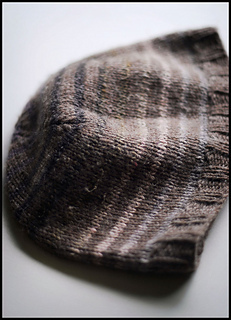 A simple, quick knit that is great for gifts and using up leftovers. Also at Knitting Daily and was seen on episode 504 of Knitting Daily TV.